We can't wait for the 2019 fall cheer season and are expecting well over 100 participants this year. Our program is tailored to the abilities and needs of the participants, and we create a positive atmosphere for kids to learn about sportsmanship, safety and team building, as well as to develop a fondness for the sport. The cheer season runs from Early August to mid-November. 1. Your child must be age 5 by September 30, 2019 to be eligible for DYS Cheer. DYS accepts girls up to age 14. No exceptions. 2. Squads are formed according to age/grade level. As some parents have more than one child, special consideration will be given to those wishing to have their children cheer on the same squad. However, if making this request, please keep in mind the age difference of your children. support Breast Cancer Awareness month. The items noted with *** are the property of DYS Cheer and must be returned at the end of the season in good, clean condition. Failure to return these items will result in a charge of $100. There is a $15 cleaning fee for uniforms that are dirty when returned. Each cheerleader is responsible for the care and maintenance of their uniform. We will have new pieces for the uniform this year. Every child will need to be fitted for her 2019 uniform. Uniform Fittings will be held in August. Your child must be registered to be fitted. 4. Participants provide their own cheerleading sneakers. The shoes should be all white in color and be either leather or faux leather, and provide proper athletic support for your child. Please do not purchase the flat soled all-white shoes meant for medical staff. (Payless Shoes and Wal-Mart carry an all-white sneaker that works well and is priced very reasonably.) Also, so if applicable, you will need to purchase a bra that can be configured in a criss cross or purchase an apparatus (such as "The Strapper") to ensure that straps are not seen while cheering. 5. We also understand that many parents involved with cheer have sons who play football. Squads are not assigned to a specific team. Squads are generally assigned to a football “weight class” based on age/grade level. However, this may not always be the case. Accordingly, we are not able to guarantee that cheer squads and specific football teams can be matched. 6. Squads will be formed in early August and your Coach will be in contact with you shortly thereafter with meeting and practice information. For the safety of all children, all DYS Coaches are required to undergo a complete background check by an outside, independent agency. Your coach will review the requirements of the program, practice schedules, game schedules, and answer any questions you or your child may have about the upcoming season during an initial team or parent meeting. This is a great time for the kids to meet each other and their Coach! 7. Cheer practice will begin in early August. Squads will practice 2 times per week and are held in the local community. Additional practices may be required to prepare for special events throughout the cheer season. It is important that the squad practices regularly in order to learn the cheers, pyramids, stunts and dances they will perform. Practice not only polishes their individual and team performance, it also builds their self confidence. All children expected to regularly attend practice. 8. The game schedule will depend on the DYS Football schedule. Again, squads are assigned to a "weight class" where available after the football draft has been completed. The draft does not usually take place until the beginning of September, so game schedules will not be available until that time. Once we receive the schedule, your Coach will share it with you quickly so that you can mark your calendars. 9. Games are typically held on Saturdays during the day at Champe High School from as early as 8:00am to as late as 6:00pm. On rare occasions, there may be a game scheduled for a week night or Sunday. Please note that during the regular season DYS squads only cheer for home games. Away games may be picked up at the Coach's discretion. During the playoffs and championships, we will cheer for games that are both home or away. 10. DSYS also participates in several fun events throughout the year! Whether it is cheering at our Pep Rally Season Kick Off, at our local High Schools, cheering in a Community parade, participating in our end-of-year Showcase, or the FCYFL Performance Day, DYS cheerleaders have the opportunity to have fun both on and off the field. 11. DYS is a non-profit organization. As such, fundraising is an important part of the cheer program. Please be aware that your child/children will be expected to particpate in reasonable fundraising efforts during the season, with each girl raising a minimum of $150. You will have the opportunity to "opt out" of fundraising activity on your Registration form and have $150 added to each child's registration fee. our organization, it would be welcomed and appreciated! If you choose not to volunteer, you will be assessed at $50 fee at Registration. If you are interested in Coaching, please click here for more information or to sign up now. 13. Please read our DYS Policies & Fees page. You will be asked to agree to this information when registering your child for DYS Cheer. 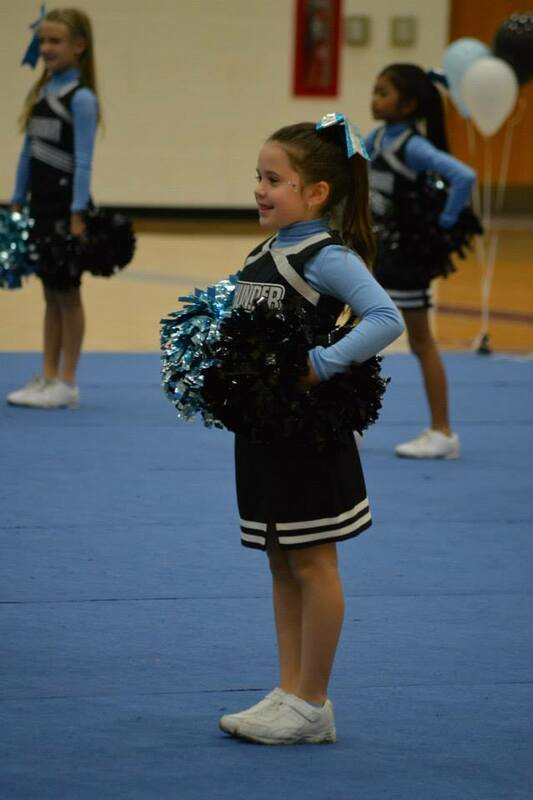 To register for the 2019 DYS Cheerleading Season, click HERE! Thank you for your interest in DYS Cheer!